In 1993, when Prabin Bikram Rana was gifted a bottle of fine French wine his whiskey-loving friends had scoffed at him: “What is this? It does not even give you a high.” Five years later, having returned from university in France, Rana was surprised to see that wine was no more a rarity in Kathmandu's stores. Bordeaux, Cabernet Sauvignon, Chianti, Merlot, Pinot Noir - slowly but surely, a new wine culture is sweeping in as people in Kathmandu have started to identify, scrutinise and experiment with wine. 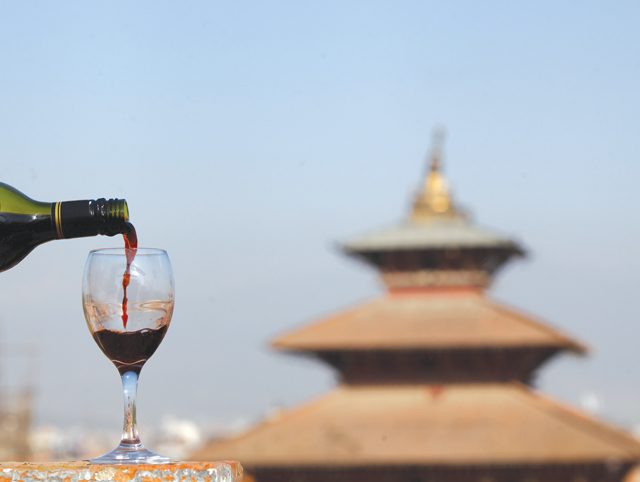 The trend has been helped along by the surprising affordability of good wines in Nepal. “People here are ready to accept any wine from any part of the world on the condition that it is of good quality,” said Antoine Garet, a French wine sommelier based in Kathmandu who feels the variety offered in Nepal makes the market interesting. “Here, if people like the wine, they like the wine,” he added, explaining that unlike in France, people in Kathmandu select wine by its taste rather than an established concept of the kind of wine due to its newness and lack of reference. This willingness to taste wine has expanded the market exponentially. Kathmandu is no longer limited to only European wines but imports New World wines from Australia, Chile and South Africa. The newest entrant is Sula from India, the success and popularity of which goes to indicate the openness of the market to experiment. Currently, a bottle of fairly decent wine sells for Rs 700-2,000. But there are wines as expensive as Rs 60,000. In addition to the greater availability in stores, restaurants offering house wines, with costs at Rs 500 a glass, has opened up a whole new demographic of consumers. “The popularity is growing, but with the tax on imported wines, it is still a luxurious drink for many and will be for years to come,” said Garet. The wine wave in Kathmandu began about 20 years ago when European wines started being sold for astonishingly low prices in the market. “Whether it was the distributor or actual vendor lowering the price, they were attempting to develop the market. If that is the case then it seems to have worked,” said Bruce Owens, an American anthropology professor who has been coming to Nepal for 40 years. However, for Owens, it is not just the increase in the variety but also the expanding vocabulary which goes to show how the wine drinking culture is transforming. What used to be limited to 'sweet' or 'non-sweet' wine has now expanded to include body and other specific details through which Nepali consumers now identify wines. What helped, Owens believes, is that alcohol was already an important part of the culture in the Valley. “So one didn’t have to overcome resistance to that,” he explained. "And it also developed a certain sophistication of the palette with people already exposed to and experienced enough to distinguish between different aila and thon, thus making it easier for people to adapt to a complex drink like wine." What has boosted the market even more is the burgeoning of restaurants like Vesper House with its extensive selection of wines, resorts like Patleban Vineyard Resort and, of recently, places like House of Palettes that offer customers a quiet evening with art and wine. Mausam Bohara, who is a regular visitor at House of Palette, enjoys the occasional glass of wine with friends and family. When asked what could be behind the popularity of wine, Bohara said: “The explosion of places devoted to eating and drinking socially, new restaurants with good wine cellars, wine tasting events, wine used in festivals and anniversaries all contributed to it." Alex Moktan of Vesper feels that as an importer, he shoulders an equally great responsibility to educate the customers. “Our aim is to let them know what they are drinking, then eventually they will put an effort and will be keen to learn,” he said. Vespers' well-equipped cellar has become a favourite for many in Kathmandu, and with over 70 labels, Vesper also manufactures wine under its own brand name in Umbria and Lazio of Italy. Riding the wine wave in Nepal are local companies who have added local and low priced wines. Hinwa has been one of the early makers of berry-based wines with a bottling plant in eastern Nepal. After suffering setbacks during the conflict, Hinwa is back with an expanded range of products. This year, Hinwa is aiming for a sales target of around Rs 130 million, up 35 per cent from last year. While Ranjitkar admits that his wine might not be at par with the wines internationally, he feels this growing trend has influenced sales as well. From a five per cent share of the wine market to now almost 35 per cent, locally made wines are also a big hit in the market. “There is widespread popularity, especially in the age group between 18 and 40, and low prices might be one of the factors,” said Ranjitkar. Samir Thapa of Silver Mountain (left) feels this is the best time to educate his hospitality management students about wines. 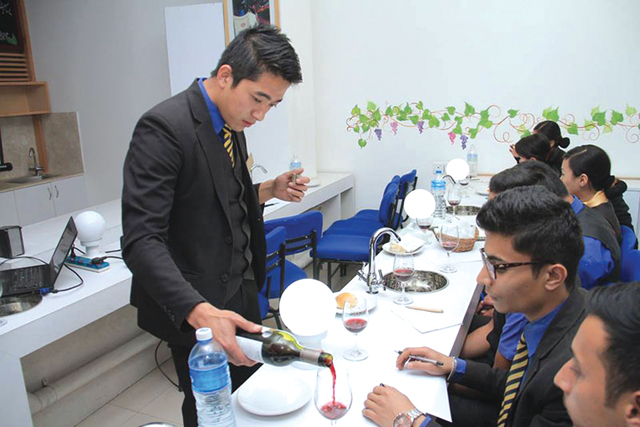 The oenology lab at his school is doing just that: bringing young Nepalis up to speed on wines. “Wine is delicate and is an integral part of food in the world,” says Thapa, who also conducts trainings for wine distributors and dealers in the Valley. With a capacity of 20 students, Silver Mountains's oenology lab is fully dedicated to the education of wine. A compulsory course, students are taught to follow a rigorous routine to sample different wines with the well-known see, swirl, sniff and sip technique. Students are encouraged to experiment with various wines to be able to develop an understanding of its origins, flavours and importance. Although the market has improved, Thapa still feels there is room for growth. “People need to be introduced to newer products for the market to grow,” said Thapa, citing examples of the Opus One Winery in the United States, which makes wine with traditional Bordeaux grape varieties, a winery unique in the Napa Valley.